I DIDN’T START OUT VERY COOL. Billy Ocean was so cool in 1986, he was so confident, cruisy and handsome. At the time I was just 10, sporting a bowl cut, freckles and a pair of bright, scallop cut, hand-me-down shorts. I was not like Billy, he was cool with Cool songs, cool goatee, cool grey suit Billy Ocean. Now as an adult I realise how tough my parents were back in Billy’s hey day. My mum nearly died in a massive head on car accident when I was 5, my dad automatically became full-time carer, cleaner, helper and a frustrated raiser of 3 children. Mums daily pain was beyond description, her disability transformed life for all of us, Dad’s frustration simmered, money was tight, the bills stacked up but I was 10, i was riding my bike, bowl cut flowing in the wind, wearing my cool shorts and I was oblivious. My parents took the hits for me. They struggled to make ends meet for me. They did their best for me and made every opportunity available for me. They made every effort to ensure that their very best could become my starting point to reach even higher in life. They were so tough and at the time and I didn’t even realise. 1. They keep showing up – they are impossible to sway, they are consistent, unshakeable and unswerving in their faith. They’ve seen God come through too many times to doubt, they take the hits and find the strength and wisdom of the Holy Spirit to not just survive but thrive. 3. They look for strength, not sympathy – you can’t have both, you must choose. Tough leaders avoid sympathy or excuses, they are looking for answers that require heavens resource and therefore chase after God and His strength with relentless devotion. They know the current obstacle is their opportunity to grow spiritual muscle and so embrace challenges with a smile. 4. Their actions talk loud – Come close to a tough leader and you may notice a quiver in their voice or a nibble on a fingernail and then you’ll see a consistent devotion to the big kind of faith steps indicative of a big dream and a big life. 5. They steward their resources for maximum toughness – time, money, energy and talents are all help for the journey. Tough leaders handle their finances, their sleeping and eating habits, guard their sabbath, and wisely manage resources to avoid crisis and to have enough to not just survive but thrive when testing times come. 7. 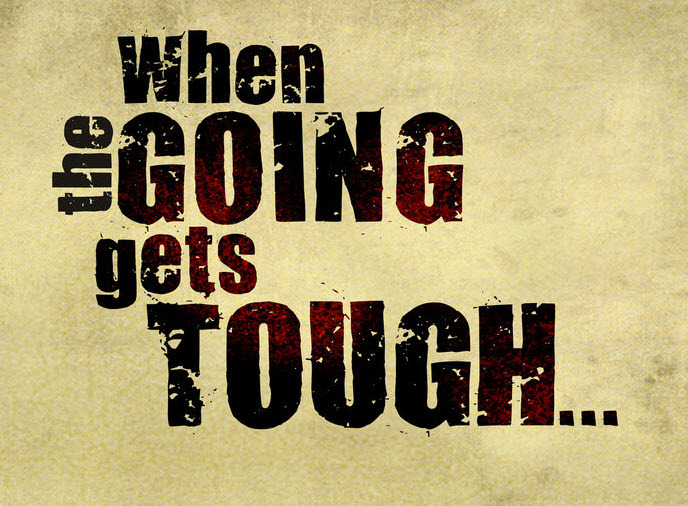 People around get tough – Stick around a tough leader and your excuses sound weird and your small thinking seems tiny. Some people just cant handle that feeling and exit stage left. Those that stick around have no option to grow, they become tougher by learning how to tackle external opposition. Internal excuses are inevitably faced, and in turn they grow to inspire others on their path of growth and toughness. 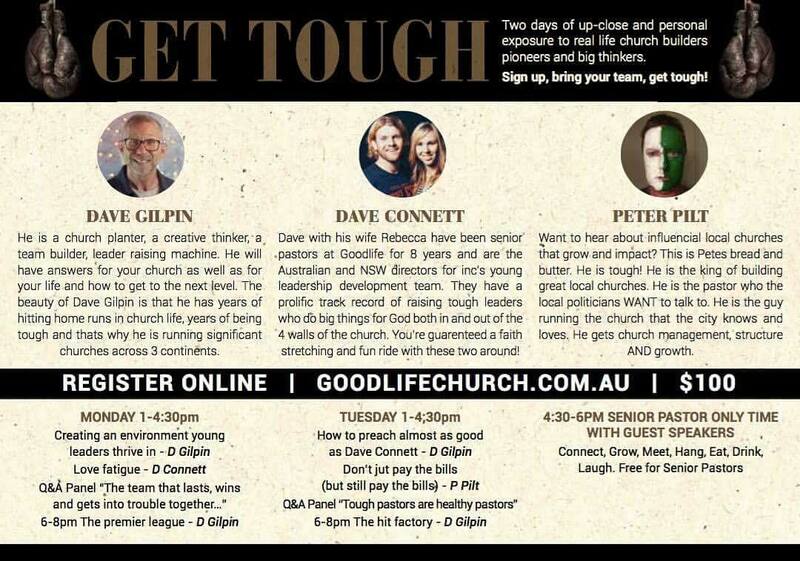 Guest Blogger Dave Connett is the host of tough leadership conference, you’re welcome to join Dave and the goodlife team as they host Dave Gilpin – the pioneer and senior pastor of the amazing Hope City Church in UK, Europe, Africa and Asia and Peter Pilt who is the International Director of Global Care after over a decade of tough leadership as the pastor of Nowra City Church. ‹ Peter Pilt’s Opinion on Pokémon Go: Harmless Fun or Unleashing the Demonic Hordes? Getting Healthy or Getting Socially Engineered? Great post on leadership, Dave Connett! Totally worth reading.